Explaining this book’s gimmick is almost certainly going to be obnoxious, but without the explanation it will be almost impossible to convey the wonder of the work. I’ll try to keep this brief. The project began as a single book, Le Carnet Rouge, written and drawn by Seagle’s occasional collaborator, Teddy Kristiansen. 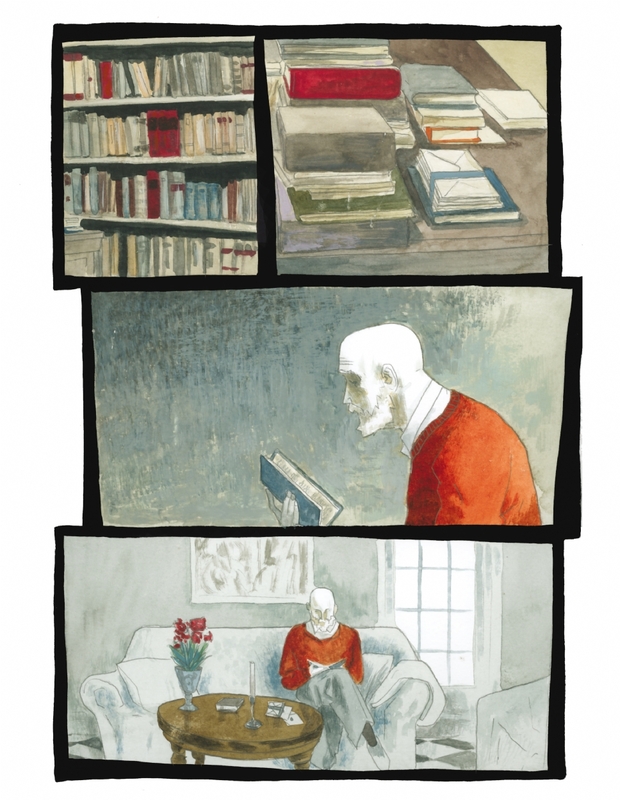 Seagle loved Kristiansen’s art on the book and wanted to bring it over to America under Image’s Man of Action imprint—only Seagle would have to be directly involved in the book’s writing for the work to be published through Man of Action. And as the book was already written by Kristiansen, that wouldn’t fly. Seagle might have gotten away with publishing via a translation credit, but he speaks neither French nor Danish (Le Carnet Rouge had already been translated into Danish. So he came up with the bizarro gimmick that would give us two books in one (the volume is presented flipbook-style, with each story reading from its respective front cover to the book’s center). Through a process Seagle terms transliteration (but is really nothing like what everyone else means by transliteration), Seagle took the Danish version of the text and adapted its sounds into something like English, then cleaned that up and massaged it into a coherent story. (In the end notes I’ll provide the example that Seagle uses to illustrate the process.) The surface-level trick is that his story is wildly different from Kristiansen’s. Using the same art. The real trick though is that both his version and Kristiansen’s are very good stories, regardless of either their process of generation or how very little they resemble each other. Both tread some of the same thematic ground, exploring characters whose identities are in flux, who submit to war as means to escape the self, and both feature a man named William Ackroyd who seeks to untangle a history divulged through a collection of diaries. But in Kristiansen’s book, Ackroyd is a biographer researching a poet who stumbles upon a more interesting story. In Seagle’s, Ackroyd is a former artist whose works are celebrated though the War took his ability to produce. In Seagle’s, Ackroyd experienced the fullest measure of WWI’s trench warfare. In Kristiansen’s, Ackroyd may not have yet been born at the time of WWI. 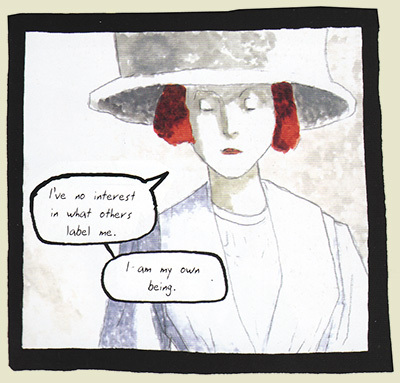 Both stories concern a British painter in 1910 Paris (Seagle specifies Montparnasse), but their stories and experiences are very different. 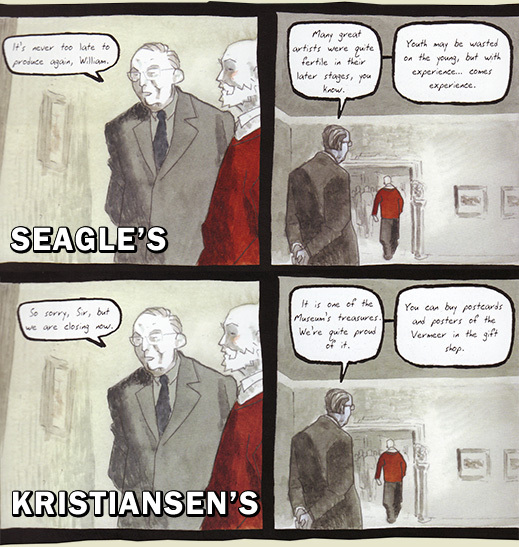 Both end up fleeing Paris, but in Kristiansen’s in fear for his life and in Seagle’s in fear for his soul. Both stories are excellent, but at less than seventy pages perhaps rather slight. Put together and in contradistinction, Kristiansen’s and Seagle’s sororal twin stories present a powerful exploration of both the human condition and the narrative craft. Taking the opportunity to tell the two fully different stories under an identical restrictive framework gives the reader a unique porthole through which to observe the vagaries of the human spirit. Where Seagle’s story might initially appear as mere technical exercise (perhaps a challenge to himself if nothing else), the final result is intriguing and entirely worthwhile. In comparing the two stories while reading—almost an inevitability due to the format of the project—the ingenuity of both creators is magnified through a sort of meta-story that extends beyond the words and plotlines and art. • Kunsten kan, på sin egan brutale måde, få alle til at føle en rus, som en frygtelig sygdom, men måske den smukkeste af alle sygdomme." • Constant can father’s sin even brutality made for all til it falls in ruin some in foretelling wisdom men made the mistake of all wisdoms. • Forever will man’s sins of brutality make for mankind until it fall in ruin wisdom itself foretells that man makes his mistakes in the name of wisdom. • Forever will man’s sins of brutality make pain for all men—until they fall to ruin—who claim that their mistakes were made in the name of a greater wisdom. Pretty weird, huh? 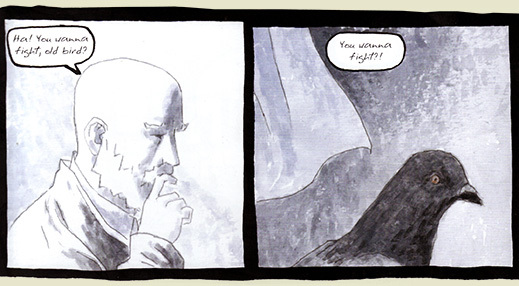 Regardless, Seagle does something magical between the Danish and his final script. I don’t know just how much massaging was done to the text but I imagine that in places, the conscious reinvention had to be pretty substantial in order to maintain the fluidity of the narrative (especially with regard to names of characters).